A photo that was bought at a flea market for $10 shows Billy the Kid standing with the lawman who would ultimately kill him, experts have concluded. The black and white image, taken in August 1880, shows the notorious outlaw with a gang of men, one of whom is Sheriff Pat Garrett, Billy the Kid's former friend and the man who gunned him down. It is only the fourth known photograph of Billy the Kid and is thought to be a trophy shot taken by Garrett and his posse after they arrested him for murdering a sheriff. It is believed to be now worth millions of dollars. The image could be the last known picture of Billy the Kid, who was born Henry McCarty. The other known pictures of the outlaw were believed to have been taken in 1877, 1878 and 1879. Frank Abrams, a North Carolina attorney, first spotted the tintype photo in Asheville in 2011. The self-described history buff said the group picture of five men was part of a set and sat on his wall for several years . . . 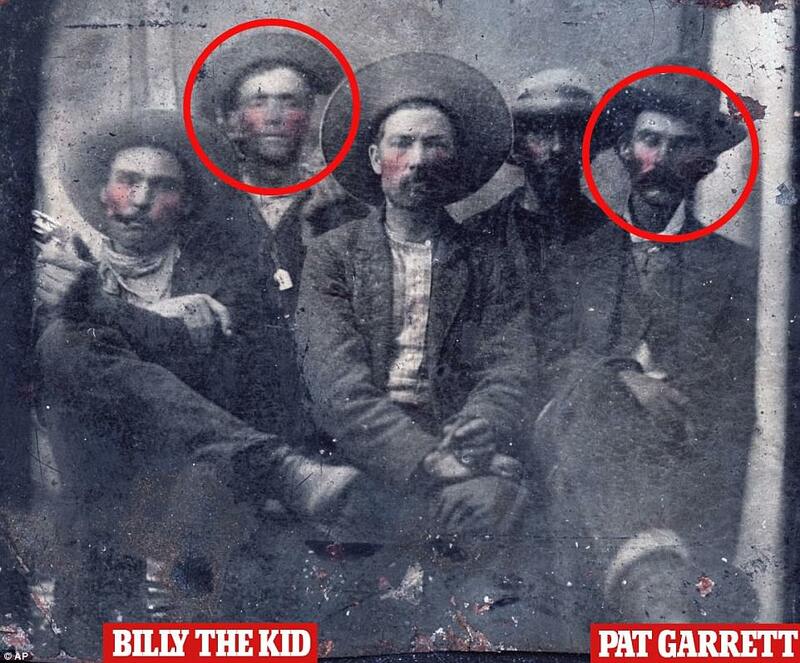 According to popular legend, Garrett and McCarty were friends before he became an outlaw, but there is no historical evidence to support the theory. What historians do know is that Garrett was elected sheriff of Lincoln County in November 1880, on a platform promising to end the violence between two groups of warring landowners feuding over dry goods and cattle interests in the county. Each landowner was supported by their own gang. McCarty, was a member of the Regulators gang.